or rather, out in the parking lot. Caught in the wild on wednesday. 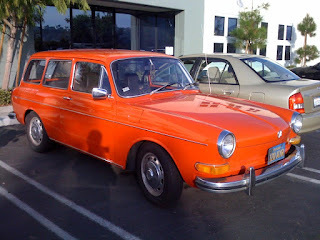 1970s VW Type 3 "Squareback"
My parents had one of these (in gloss red) for a few months back in 1976. They had bought it used from PJ's Used Cars in Decatur, IL and sold it after discovering a number of problems with it. I bawled like a five year old (hey, I *was* five) when they sold it (for more than they paid for it). 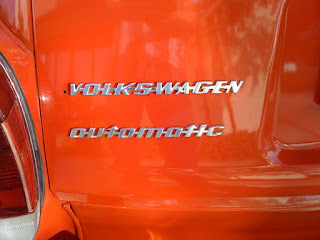 I walked around it and grabbed a deep whiff of the unmistakeable air-cooled VW interior. Too bad this one is saddled with an automatic transmission. Hey, Lynn had one of those (also in red) when we first met. It was named Adolf. I've always heard that the distinctive smell of air cooled vw's was from the horse hair used in the seats. Probably that and the vinyl. I still remember a day at the Boulder Schwinn when you and I were walking out of the building and there was a Beetle in the parking lot with its windows cracked open. We stuck our noses in for a hit of that unique aroma.